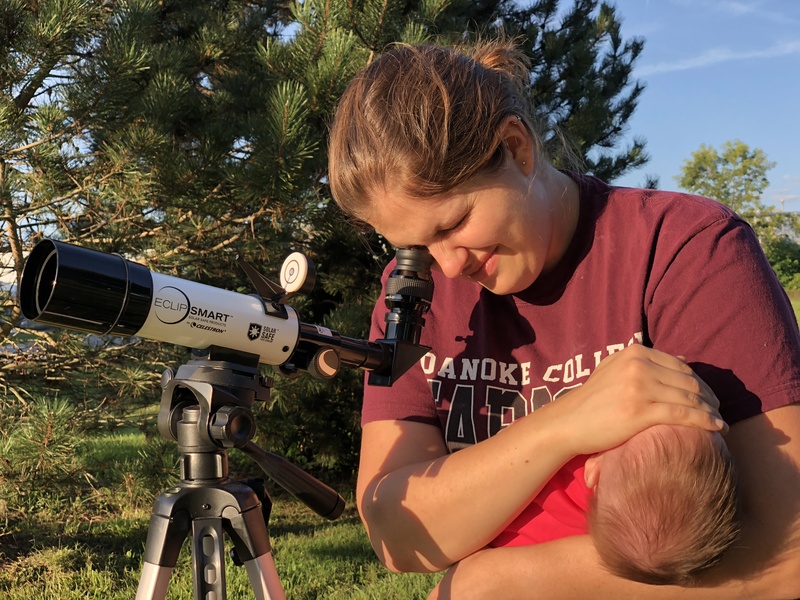 Lauren practices safe solar viewing for herself and our daughter. The journey began with the arrival of my friend, Cody, who was joining me on this pilgrimage to totality. We left my house and hopped on interstate 81, where we were greeted by a car from New Jersey flipping off a car driving slowly in the passing lane. The number of out of state and out of country plates heading south on 81 was a reminder of how popular and unique this event was. We chose Madisonville due first and foremost to its central location for totality and its low population and relative distance from the nearest interstate. Our hope was that these combinations would make it a little less cramped and easier to get out of than other surrounding areas. Our hotel was my nice and still fairly new Mazda 3 Hatchback parked at a Walmart. Other than a group of teenagers waking us around four in the morning, we slept alright considering it was a car parked at a Walmart. As night turned to day, we awoke and drove to a Hardee’s for a nice breakfast with the locals. Driving through the cute downtown of Madinsonville, a sign said that the local library would be throwing an observing event. After parking at the library, Cody and I walked through downtown and enjoyed some coffee at a small shop. By this time, a good number of people had started to arrive in Madisonville. 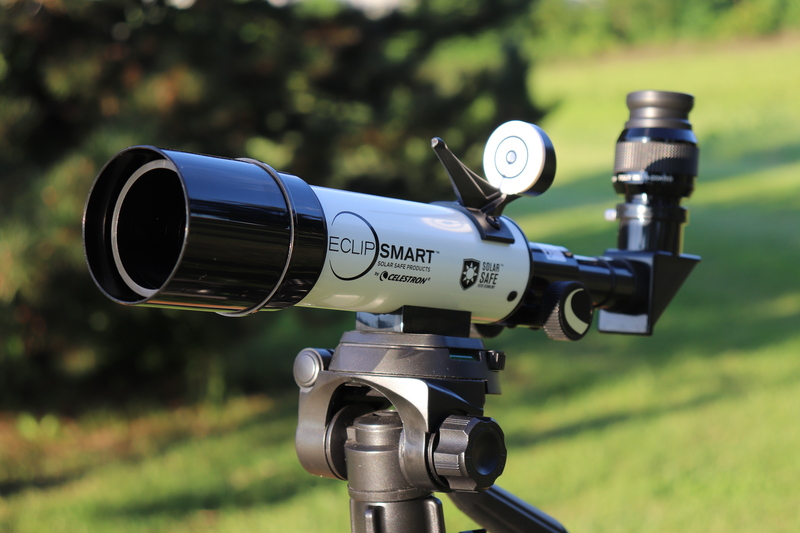 Our chosen spot at the library ended up connecting us with some interesting couples, two of which had witnessed totality on separate occasions and one who had brought a solar telescope for observing the event prior to and after totality. As the time approached, we began to look up at the sun wearing our ISO rated solar glasses, and right on schedule, a sliver of the Moon was visible blocking the extreme upper right corner of the Sun. This gradually grew as the minutes passed. Before long, a third and then half of the Sun was blocked, giving it the appearance of a crescent Moon. The sky very gradually grew darker, particularly at 20 minutes out from totality. The shadows of our bodies and hands were different, almost appearing soft and out of focus. 10 minutes or so out from totality, the birds began to chirp, and at 5 minutes out, crickets began to sing. The temperature appeared to be cooler, but it was mainly due to less radiant Sun hitting our skin. The surrounding environment became very similar in appearance to about 30 to 45 minutes after sunset or if a strong storm with cloud cover was overhead. The Sun now appeared as a slight pencil line in the sky. It then disappeared from the view of my solar glasses. As soon as the Sun disappeared from view, I looked down at my apple watch and the time was exactly 2:32:54 PM. Hearing people cheering, I removed my glasses, looked up and where the Sun had been saw the disc of the Moon completely blocking out the Sun. There was a soft glow coming out from it’s sides and what appeared to be the corona spanning out much farther than I had anticipated. I started my stop watch a few seconds late so I could time when the totality would end. Looking around, there was an eerie 360 degree glow on the horizon appearing as though a sunset was occurring all around us. Venus and Regulus were the most visible stars to appear in the sky, with Venus off to the right and Regulus barely visible just off to the left of the Moon. The time passed quickly, and I looked down at my watch realizing we were coming up on the end of totality. I put on my glasses anticipating the Sun returning and at that time heard someone shout out “The Diamond!” I pulled down my glasses looked up briefly and saw a beautifully bright arc of light appear in the extreme upper right hand corner of the Moon’s disc. It appeared as though God had turned a bright floodlight on in that corner of the Moon. I was startled by this, not quite sure if it was safe for me to see and quickly brought up my glasses and began to see the sliver of the crescent Sun return! It was an incredible event to experience, and the trip home was not as busy as we had feared with traffic. Next time, though, I think I’ll try to book a hotel instead of a Walmart.